Government of Indonesia targeted to build 1.000 km of toll road for the next five years (2015-2019), however there is a distinctive gap in Indonesian toll road investment. Nonetheless, toll road development is closely related to risk, after the 1998 crisis common perspective that Indonesia is identified as a high-risk country. Therefore, investor is reluctant to invest in Indonesia. 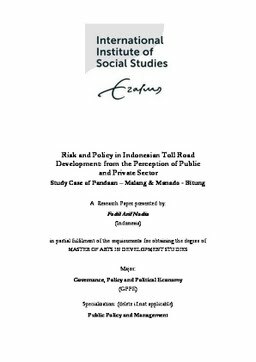 The purpose of this study is to define impact of policy reform (Government Guarantee) on the risk of toll road investment in Indonesia from the perspective of the public and private sector. As an exploratory research, this study relies on secondary research literature and data such as feasibility study, law & regulations and monitoring data in toll road sector. This study also uses the interview to obtain perspective from the two stakeholders. In additions, by using two study cases, it compares the mechanism, implementation, and limitation of government guarantee scheme in two different regions. The findings indicate that the policy is not effective in reducing the risk in toll road development rather more like a procedural step to the received financing. The lessons learned are valuable for determining appropriate government guarantees for future PPP projects.